GE’s lost a staggering $400 billion worth of their money on his watch. I think it’s very telling that GE’s stock was worth less on the day he left than on the day he joined the company. And, unfortunately, millions of investors who’ve gone along for the ride have gotten clobbered. 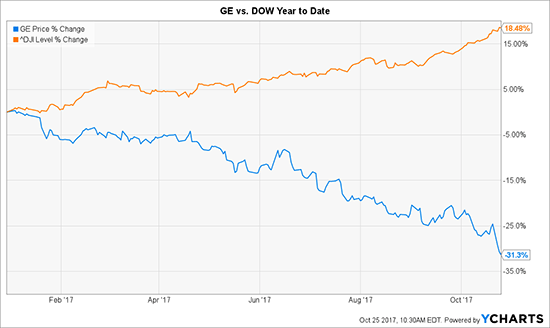 Adding insult to injury, GE’s stock is off a stunning 31.3% this year alone while the Dow has put in a staggering 54 new record highs over the same time frame. Don’t believe a single one of ’em. The GE we know today will not exist in ten years… if at all. In fact, I think it’s highly likely that GE gets dropped from the Dow, which would be the ultimate irony considering that it’s the only original listing left from 1896 when the Dow was created. GE is in such bad shape that it’s skewing the ratio of the highest to lowest priced stocks in the venerable industrial index. GE’s profits have repeatedly fallen short of expectations, cash flow difficulties make a dividend cut very likely on November 13, and poor management execution is de rigueur. It doesn’t matter whether we’re talking about an American icon or not. I see very little evidence that GE executives understand how to move the company forward, which means, by implication, that they don’t understand the markets within which the company operates. That’s hardly a recipe for success… perhaps at the tables in Vegas, but that’s a different line of thinking. The irony, of course, is that Immelt wanted to create a simpler, far more valuable industrial company. Instead, he’s leaving behind a ruined shell no consumer presence to speak of, very little in the way of commercial product viability, and almost no development pipeline. Wall Street, naturally, doesn’t see things that way, which is hardly unexpected. They make their money by keeping you in the game so publishing a positive spin is par for the course. Again, don’t fall for it; what Wall Street says is very different from what Wall Street does. There are 11 analysts who still rate GE a buy, according to Bloomberg, and I’ve got to believe all of ’em are willing to ride GE into oblivion. You know how dangerous that is from earlier conversations we’ve had about traditional analysts’ desire to be right even at the expense of being profitable. The situation reminds me of Enron, where fifteen analysts covering the stock rode it all the way down from $90 a share to roughly $8 a share and a loss of 91% (right before the company disclosed that five years of earnings would have to be recalculated) before changing their collective minds. Even worse, two brokerage firms didn’t downgrade Enron from a “strong buy” until it hit $4.14 a share! Or, International Business Machines Corp. (NYSE:IBM), which completely missed the pivot to cloud-based computing despite being in the business. It’s never recovered from the erosion in its traditional software, hardware, and consulting businesses… and probably never will. Or, Sears Holdings Corp. (NasdaqGS:SHLD). CEO Eddie Lampert arguably killed the company through a constantly shifting series of changes intended to reinvent the beleaguered retailer that, years ago, I called the single most dangerous stock on Wall Street when it was trading around $31.50 a share. Lampert, by the way, has reportedly pocketed millions through special financial arrangements and dividends that went to Sears Holdings and ESL Investments, even as the company continues to fail. Contrary to what people remember of the company that promised to “bring good things to life” in the 1980s, GE is not the omnipotent conglomerate it used to be. Rather, it’s a “things and stuff” company with little more than a hope and a prayer of fitting into tomorrow’s economy, barring massive changes or a complete reboot. I see it as the industrial version of Kodak, and the fact that millions of investors cannot believe GE could fail makes me think so even more strongly. What I mean by that is that the company makes products that are arguably better suited to the America of yesterday and to its manufacturing base of 30, 50, or even 100 years ago. Not tomorrow’s tech integrated world. GE tried to rebrand itself into a “digital” company in 2016 by making a pivot into smart sensors and other high-tech devices that were supposed to integrate with the Internet of Things and dramatically boost profits. But, we wouldn’t be having this conversation had that worked. Plow the proceeds into a far more stable and attractive alternative like Apple Inc. (NasdaqGS:AAPL), which is lined up with our Unstoppable Trends, makes “must-have” products, and keeps risk to razor-thin levels. Try buying at-the-money put options like the GE January 18, 2019 $23 Put (GE190118P00023000) that can deliver blow out profits if GE does blow up in the months ahead. Tactically speaking, you’re going to be fighting Wall Street’s vested interests, so tread lightly. I suggest keeping the amount of money on a speculative trade like this one between 1-2% of total investable capital. Use only money you can live without because it’s going to be volatile and you may have to ride this one all the way to the proverbial buzzer like a rodeo cowboy before it pays off. The other consideration is that you don’t have to put this trade “on” all at once. Many investors make the mistake of thinking in all or nothing terms but in a situation like this one. I think it’s far easier and less risky to “average in” over time. That way you can use every last gasp from Wall Street as a means of maximizing your returns by taking advantage of market fluctuations between now and when the trade expires. P.S. If you’re one of the thousands of retirees across America depending on General Electric in your retirement portfolio, it’s time to look elsewhere – both for security and for rapid gains. When it comes to the latter, look no further. A new and rare substance has just been found to exponentially (and cleanly) increase the power production of every energy source in the world. That includes oil, natural gas, solar, wind, geothermal, nuclear, hydro, and more, and one tiny company just got control of a potentially massive $70 billion treasure trove of it. Click here for details. Keith I remember reading an email not too long ago where you were highly recomending GE due to the pending infrastructure spending bill. You said they were poised to profit the most compared to any other companies.